The SLC have been highly impressed with Chandika and feel that he is the perfect man for the job as head coach of Sri Lanka. 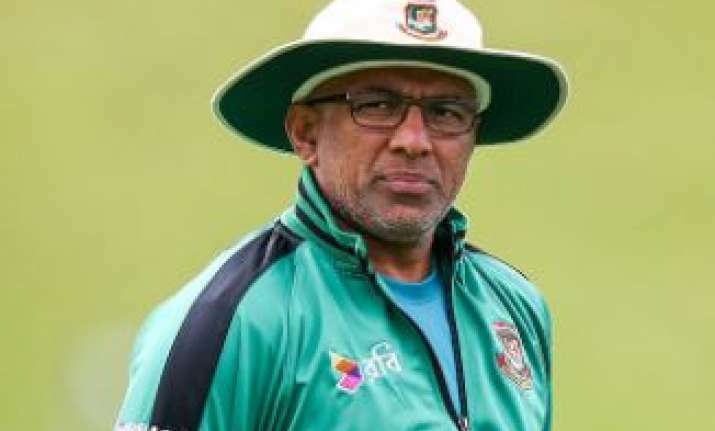 Image Source : GETTY IMAGES A file image of Chandika Hathurusingha. After days of speculation, Sri Lanka Cricket (SLC) have finally expressed their interest in hiring former Bangladesh head coach Chandika Hathurusingha for the top post, with SLC president Thilanga Sumathipala saying he would be "a great fit for us". Interim coach Nic Pothas has been handling the management and the board want a suitable candidate to do the job. The Lankans have not been the best of forms and a major concern was when India whitewashed them 9-0 in all formats when the Men in Blue toured their neighbours in July. "There's no doubt that Hathuru would be a great fit for us with the direction of both our short and long terms goals," said Sumathipala, as media reports suggest. "I have written personally to the BCB President -- Nazmul Hassan informing him of our intentions. The Executive Committee is both convinced and confident that he is the right man for the job, and we would like to bring him on board in a professional and transparent manner." According to the report, SLC stated that they are currently in discussion with Hathurusingha's lawyers and ready to "offer him the position" of head coach if he was released from his contract with the BCB. The Islanders are without a head coach since June this year when Graham Ford resigned after a second stint that lasted merely 15 months. The SLC elevated Nic Pothas as interim coach as it began to look for a suitable candidate. If Hathurusingha is appointed Sri Lanka's coach, his first assignment may well be against Bangladesh, whom they play in a tri-series also featuring Zimbabwe in January 2018.